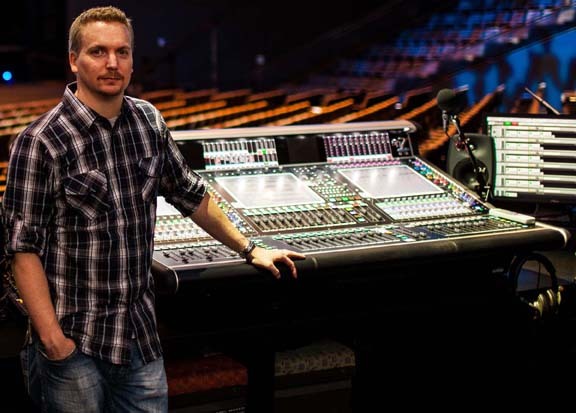 Waves Audio, a leading provider of audio DSP solutions for professional, broadcast, and consumer electronics audio markets, is proud that its plugins are key tools for Jason Aulds, the talented Associate Director/FOH Engineer at the Dallas, Texas-area Gateway Church. The church, a large worship community spanning four campuses, is a Bible-based, evangelistic, Spirit-empowered church led by Pastor Robert Morris. The church’s sound setup is impressive: three DiGiCo SD7 consoles at the main campus; four DiGiCo SD8 consoles across the other campuses; and an AVID Venue D-Show console set up for travel. The SD8’s are paired with the Waves SoundGrid Essentials bundle, and the D-Show is complemented by the Waves Live Bundle. And through it all, Waves plugins are a key part of his tool set. Aulds singles out a few particular favorites: “C6 and C4 compressors, and the entire Renaissance Maxx bundle,” he enthuses. For vocals, he uses the Renaissance Vox, Renaissance DeEsser, CLA-2A Compressor/Limiter, C6 and occasionally the Aphex Vintage Aural Exciter plugin. On drums, he uses Q10, CLA-76, SSL G-Channel, and the wide-band component of Trans-X for kick; SSL Channel for snare; Q10 and the four-band Trans-X Multi for toms; and API 2500 for the group mics. He usually uses CLA-76 on bass, but occasionally he’ll use C4, API 560 or MaxxBass. On guitars, he likes to use the SSL Channel and sometimes the OneKnob Series Phatter, Driver and Brighter plugins. He also uses the CLA-2A for keyboards. On the main mix bus, he rounds things out with the MaxxVolume, C6 and PAZ Analyzer. Visit www.waves.com for more information.